Healing liniments have been around for a long time and speaks to their effectiveness. So what are liniments? Liniments are formulated for helping with circulation problems, arthritis, rheumatism, sprains, strains, and bruises. Originally Elana started researching liniments to help her horse Hank in the show ring in-between their events. 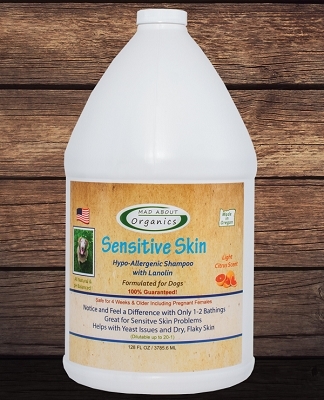 Elana just could not find a liniment that met her demands, which is why Elana and her mother Sue started developing our one of a kind organic herbal healing liniment. 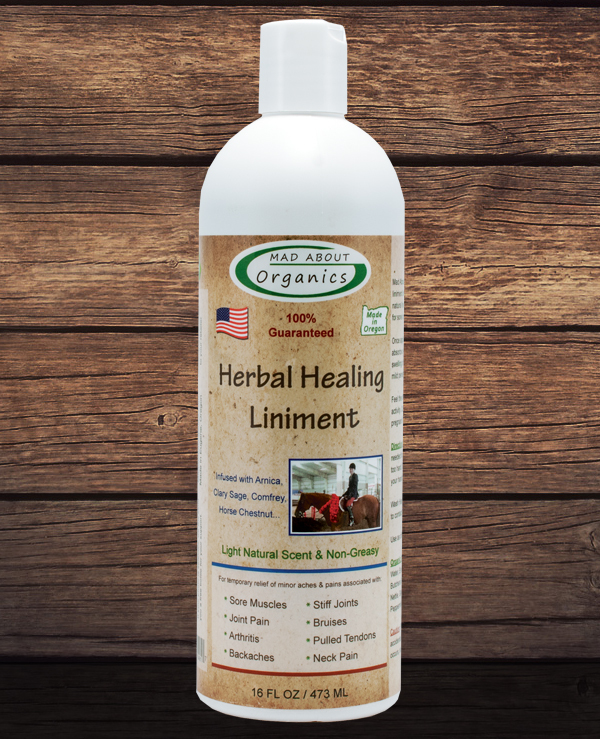 Our organic herbal healing liniment is definitely one of our greatest creations yet! 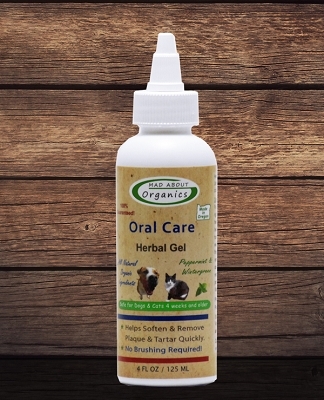 Our naturally pure organic herbal healing liniment with Arnica, Peppermint, Clary Sage and other natural ingredients provides fast-acting relief and contains no chemicals or harsh abrasives. Our formula dries extremely fast typically within 30 seconds and will not leave the area oily or grease, making it an ideal choice. Designed to help heal and dissipate fatigued muscles, stiff joints and arthritis pain very quickly. Great to use as a massage liniment before and after exercise or event. We have many of our customers falling in love with this product within the first application. They are truly amazed on how fast they can see and feel the results and we know you will to. Simply apply to arthritic joints, overexerted muscles, or swollen limbs. No need to mess with cumbersome leg wraps, since the liniment stays in place and natural plant extracts work to increase circulation in the applied area. Creates a cool rush of relief followed by a soothing, deep-penetrating heat that helps reduce swelling while increasing blood flow to the area pulling the pain away. Acetone-free solution is safe for use on even the most sensitive skin and reduces evaporation rates to keep liniment working longer. 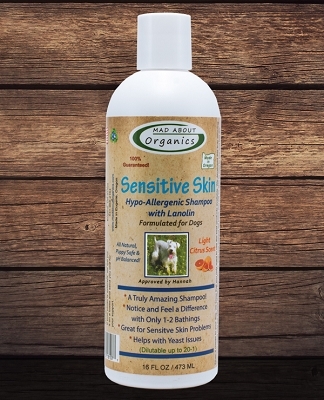 Also, Mad About Organics' Organic Healing Herbal Healing Liniment is suitable for injuries that require prolonged heat treatment, such as splints, sprains, bruises, bowed tendons, and bucked shins. 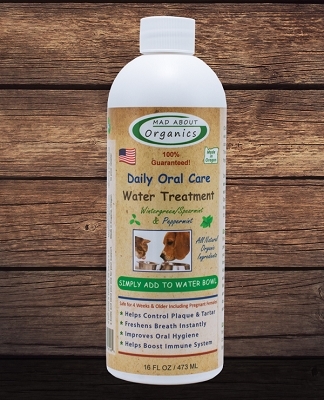 Mad About Organics' Organic Healing Herbal Healing Liniment is made in the USA - based in Eugene, Oregon and packaged in a recyclable plastic bottle. This was extremely helpful. Nongreasy and a nice smell. No "linement" smell soothing. Great product. Simply apply the amount needed to cover the affected area evenly, gently work in with fingers (Do not rub hard). Use as often as needed for persistent or chronic swelling. Once dry, if hair is tacky, just brush through. Can be applied as often as needed. Caution: Keep out of eyes, if you do get some in the eyes, rinse thoroughly with warm water.